NBC Sports Group gave hockey fans an up-close-and-personal look at Tuesday’s NHL Winter Classic at Notre Dame Stadium courtesy of the RF Wireless RefVu camera system outfitted on a referee’s helmet throughout the game. The RF Wireless RefVu camera system was mounted on a referee’s helmet throughout the game. Although the use of a helmet-mounted camera on a referee is not a new concept for NBC’s Winter Classic coverage, the RefVu system offers the ability to shade the camera with remote real-time RCP/CCU control. As a result, the camera angle went from what was previously a purely iso record solution for replays to a true live solution for the line cut. Given the ability to have the referee POV camera match NBC’s other cameras more closely, the production team was able to cut to the referee POV live throughout the broadcast, as well as using it for replays. The current RefVu system operates at 1080i with similar latency to other high-end handheld cameras used in live sports coverage. RF Wireless launched RefVu in September as part of a 30-game package of NHL regular-season games for Rogers Sportsnet. Thanks to the ability to have the referee POV camera match NBC’s other cameras more closely, the production team was able to cut to the referee POV live throughout the broadcast, in addition to using it for replays. 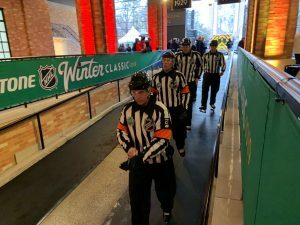 NBC first used the RefVu on Dec. 12 for a Chicago Blackhawks–Pittsburgh Penguins Wednesday Night Hockey game at Chicago’s United Center. According to Bunn, the NBC Sports production team became so comfortable with the system’s reliability and shading ability so quickly that the angle was cut into the line cut multiple times before the first period had ended. Rogers Sportsnet will be using RefVu for the NHL All-Star game in San Jose, CA, later this month. 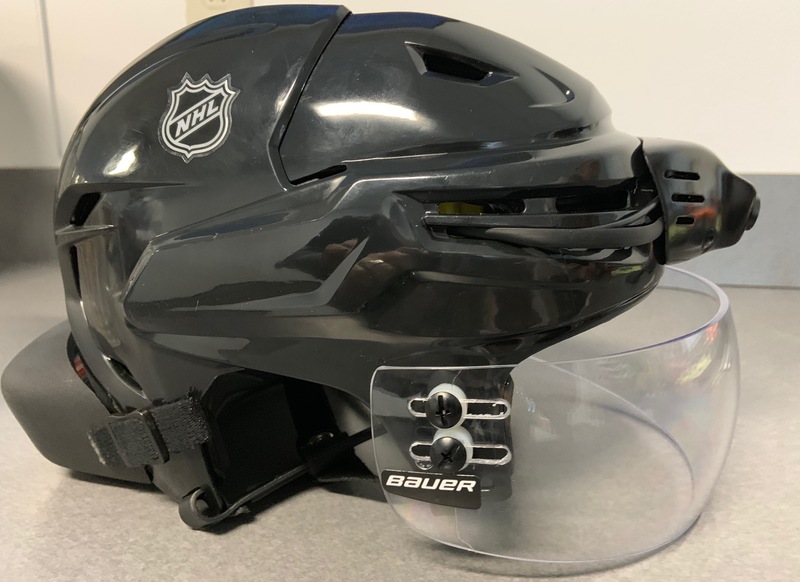 NBC will deploy it at the 2019 Coors Light NHL Stadium Series Penguins-Flyers matchup at Philadelphia’s Lincoln Financial Field on Feb. 23. 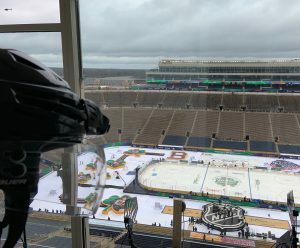 The RF Wireless RefVu camera was deployed at Notre Dame Stadium to provide viewers with an up-close-and-personal view of the NHL Winter Classic. The paintable RefVu is the first of many configurations moving into the market from RF Wireless. With prototyping in the works for other configurations and options, Bunn and company look forward to keeping creativity flowing and putting more units in the field.